One afternoon I stopped at a gas station that was definitely in the middle of nowhere. My bike was at 75 miles from the last fill-up, 75 miles from the last gas station and I was beginning to wonder if another gas station would ever arrive. The gas station sat all alone beside a dirt road. It was a small low building, with a roll-up door and an old pick-up truck sitting in the bay. Both the building and the awning over the soon–to-be-in-a-museum-gas-pump looked like they were straight from an apocalyptic Science-Fiction movie. The pot bellied man behind the desk looked startled to see me. As if I was the only one who had stopped by all day. And I probably was. His head was covered with a trucker hat, his hands were creased with hard work, and the creases were filled with permanent grime. “You’re a little early, aren’t you?” he said. I looked confused back at him. “Most people don’t show up for another few weeks.” And looked at me like I was a complete idiot, like I was some city boy who had no idea what I was getting myself into. I became defensive, knowing that he was looking down at me, laughing at my ignorance. Enjoying that he knew what was going on, and I didn’t. So I tried to be logical. I told him that the weather reports said that it was spring, and that there was no reason to believe that I was going to be stuck in bad weather. He just looked at me with a little smile, a knowing smile, a smile knowing that I did not know anything. After we exchanged money for the gas, he wished me luck, with a much too large grin, and I smiled and thanked him. Thinking that he was just trying to make me paranoid. That was, of course, when the weather started getting cold. I had gone and checked the weather before I left, the average temperatures in May no longer went below freezing at night, and the average snowfall, was so close to zero it was really nothing. The temperature slowly dropped as I continued my journey, to where it was 45 degrees F in the afternoon. That, of course, does not count the wind chill factor. I was traveling at 70 mph, and at that speed, it is supposed to drop the actual temperature 40 degrees. Or 5 degrees F, -15 degrees C.
There was a thick scarf wrapped around my neck, stuffed both up into the full-face helmet and down into my leather jacket to keep the wind out. Underneath the thick leather jacket was a long sleeved t-shirt, a turtleneck, and a sweater. On my hands were leather gloves, glove under liners, and a pair of socks on my wrists, with the toes cut out, to keep the wind from going up the sleeve of the jacket. There were two pairs of socks underneath the boots, and on my legs were long underwear, jeans, and plastic rain trousers. When my motorcycle decided on it’s own to stop, sometimes I would place my hands, with gloves, directly on the side of the engine, and hold them there until the heat began to hurt my palms. As it got colder and colder, the ache in the muscle on my right shoulder grew exponentially. It ached because it was under tension all day, holding the throttle open. In the evening, when I had found a hotel room, I would stand under the blazing hot water, and kneed it with my other hand. Waiting for it to do what it always did, continue with it’s slow ache, until the blood rushed to it and then fill my shoulder with ten seconds of blazing pain, until it settled into a dull ache again. I swore, over and over again, that I would never do something this stupid again. I would have a bike with a faring, one of those cool new BMW’s with the heated grips. I told myself I would leave later in the year, that I would do it in a car. At one point the long low hills faded away into a mountain range. It was not a tall mountain range, only a couple thousand feet higher than the road below. But that was enough. As I crested a ridge near the top there was a lake, and I thought of the man in the gas station, and how he must be laughing. The lake was frozen over. It was not that there were a few icebergs floating around, it was still completely frozen over, it looked thick enough to skate on. There was snow around the lake, but the blacktop of the road was clear of snow. Ok, I admitted to the gas station man in my head, maybe I was a little early. The clouds were hidden behind the mountains, deep grey clouds, leaning to black, in the direction I was heading. Up until now, the only serious rain was a thunderstorm on the California/Oregon border. I looked ahead, into the grey clouds, and thought, it doesn’t look so bad. It began to snow once I passed the lake. Large wet dollops of mostly ice, that melted as soon as they hit my visor. Luckily they melted as soon as they hit the road as well. But I could feel them, I swear I could feel each one hit my outer jacket, and feel the freezing cold soak instantly through all those layers directly to my skin. I was to learn while living in Alaska, it is better to be in cold dry snow, than warmer slush. My bike and I crawled along between the evergreen trees, with visibility down to fifty feet because of the low clouds. All I could think, was that it’s probably fifty miles to the next shelter. My hands were beginning to cramp, and the cold wind that slipped under the visor –to keep it from fogging- made my nose run. After a short while, my mind twisted, and I looked up from the single-minded road, and out upon the scenery. On my right were small fields before the mountain rose into the fog, on my left was a forest of evergreen trees. The mist surrounded and hung to everything, and I was in a surreal world, enclosed in this little space. I no longer felt the cold, or the wet, and just looked around and enjoyed this real moment from a fantasy movie. This is where the hero sees the unicorn. That was when the hotel loomed up on my left, and my surreal experience gave way to the need for coffee. The car park was empty, and the front desk was empty. But there was a pot of coffee sitting out, and after glancing around, I poured myself a mug. With my outer layer off, I sat down until my hands hurt from the hot mug and I stopped shivering. Five or ten minutes later a young lady wandered through the lobby and looked surprised to see me. 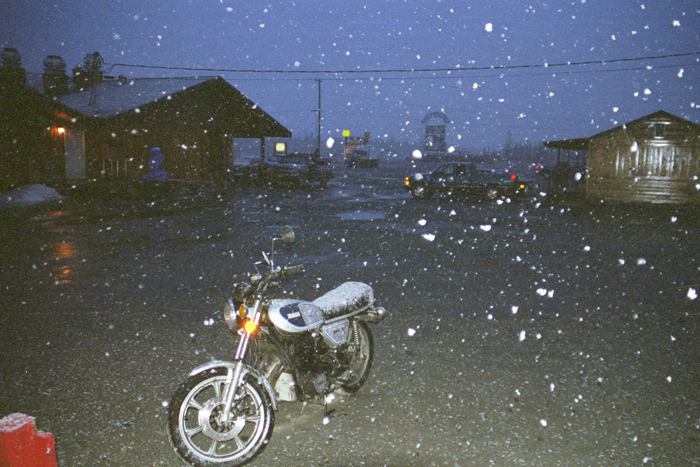 I smiled and said that I was just stopping for a few minutes to try to let the snow pass by. I said that I took a cup of coffee and needed to pay for it. She said to not worry about the coffee and smiled and went on to whatever she was doing. I saw no one else in the hotel. After twenty minutes the clouds went from grey to white, and I piled all the clothing back on, and headed back out onto the road. A few days later, after crossing the boarder into Alaska, I came across the town of Tok, -pronounced like what you do with a cigarette, not what a clock does. There were only twenty of so buildings visible from the road, so I had some dinner at the motel coffee shop and watched bad television. Tomorrow was the final ride, the last of the ten days of riding. The last day, where I was finally going to get to Anchorage. To finally arrive where I wanted to go. I was excited, I was actually going to arrive in the town I was heading for. I was sick of holding the throttle, sick of unending road, I wanted to settle down for a short while. The 400 miles on the last day seemed simple. It seemed like just another day, like it could happen without any effort, nothing could stop me now. Nothing could stop me now? Huh? When I opened my door to have an evening cigarette, little while specks were falling from the sky. They collected on the seat of my bike, but melted instantly in the muck of the parking lot. I assumed that it would be like riding thought he mountains, it would go away quickly. Over the evening it fell and fell and fell. There was no strong wind or storm, the snow just quietly fell and covered the ground. 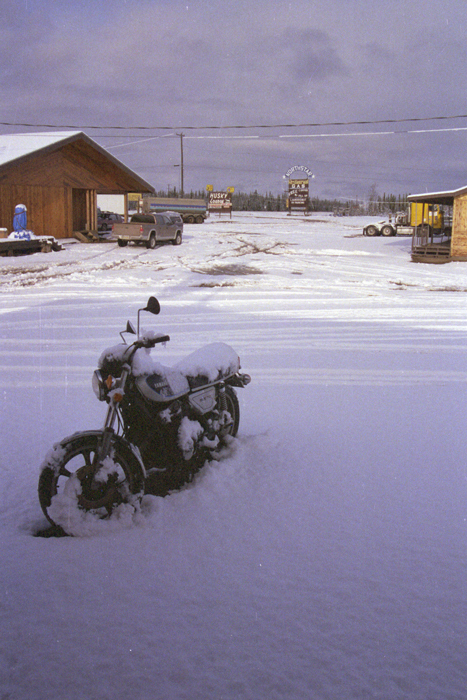 When I awoke in the morning, there were a few inches covering the ground, and my bike was piled thickly with the stuff. I went to the coffee shop for breakfast and to consider what I was going to do for the day. I asked the waitress what she thought of my chances of making it to Anchorage. She pointed me toward a man in another booth, who had flown into Tok yesterday. He said that the roads here were already cleared. 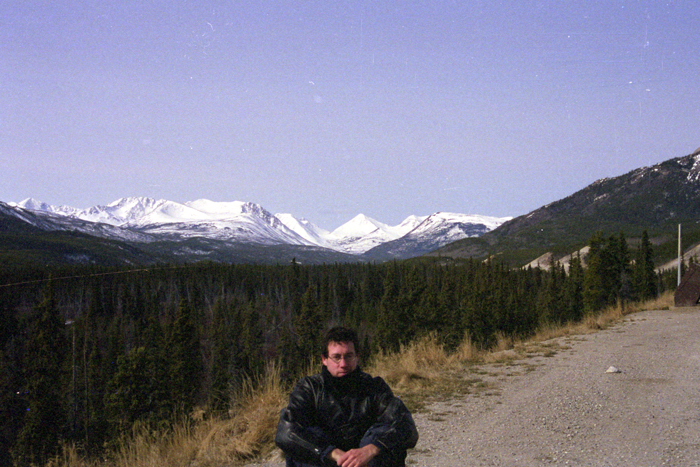 But on the road to Anchorage, there was a mountain pass, that had probably got two or three feet of snow. The removal crews would probably not be there till this afternoon. He answered that it was probably not a good idea. 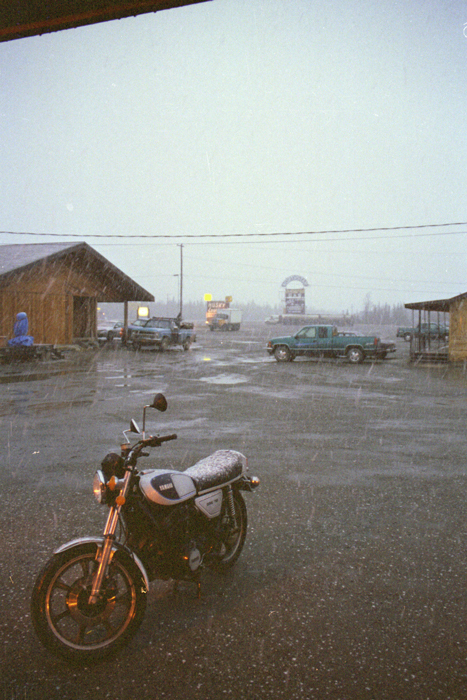 I spent the day in Tok, listening to the man from the gas station laughing quietly. 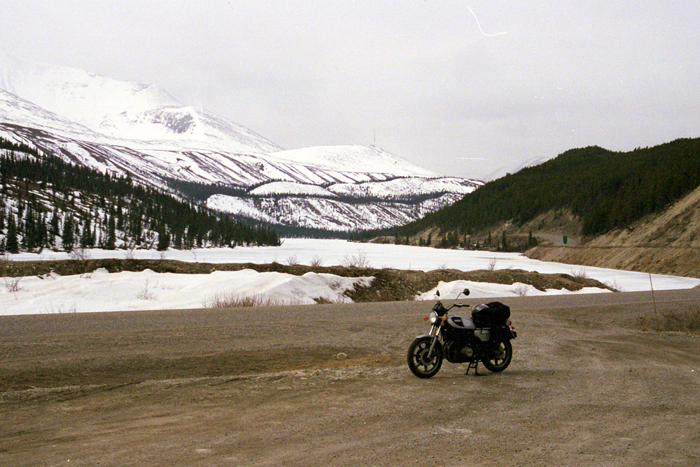 On the following day, when I rode to Anchorage there were three foot snow banks on the side of the road through the pass. The road was dry and clear, except for the wide shallow rivers of run off water crossing from one side of the road to the other.